Stanley N. Gundry, series editor for the Counterpoints Series, and Amy E. Black, general editor. 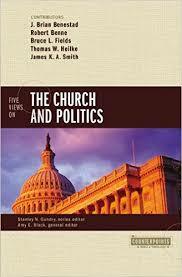 Five Views on The Church and Politics. Grand Rapids: Zondervan, 2015, pp 240, $19.99, softcover. Zondervan’s Counterpoints series exists to provide a forum for Christians to discuss and critique different views on important biblical, theological, and cultural issues. 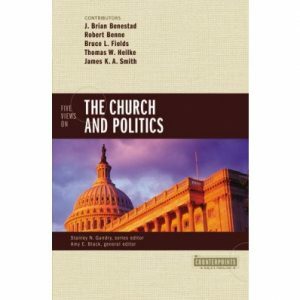 This volume on the relationship between the church and politics seeks to navigate this challenging topic with clarity and substantive dialogue. The five views represented are the Anabaptist (or Separationist), the Lutheran (or Paradoxical), the Black Church (or Prophetic), the Reformed (Transformationist), and the Catholic (or Synthetic). Amy E. Black (Ph.D., Massachusetts Institute of Technology) serves as the general editor of this volume, and her contribution is especially helpful to students engaging this discussion. Black is Professor of Political Science at Wheaton College and is a prolific author of several noteworthy books and articles. Black’s introductory essay succinctly summarizes the wide array of responses centuries of Christians have offered in response to one’s allegiance to Christ and the rights and responsibilities that earthly citizenship requires. Black carefully articulates the four major theological traditions (Catholic, Reformed, Lutheran, and Anabaptist) who have a distinctive set of teachings or values corresponding to what may loosely be called a political theology. The addition of the Black Church tradition is warranted because it is specifically rooted within the American experience, and it represents a “distinctive theological perspective, not to mention forms of communal practice, that is too often discussed in isolation or simply ignored” (p. 8). Black’s introductory essay then summarizes the organizational structure of the book. Each view is presented and defended by a specific expert, and the other participants dialogue with responses and/or rebuttals to each presented position. Additionally, each presenter reacts to a case study on domestic poverty. This assignment further illuminates the similarities and differences these positions have regarding the same scenario. Thomas W. Heilke (Ph.D., Duke University) presents the Anabaptist view. Heilke is the Associate Dean of Graduate Studies and Professor of Political Science at the University of British Columbia, Okanagan. In addition to this volume, Heilke is author, co-author, or co-editor of more than forty publications. The Anabaptist view, among those presented in this volume, espouses the most limited view of Christian involvement in politics. Heilke’s contribution is a nuanced presentation of the Anabaptist position. The uninformed reader unaware of Anabaptist beginnings will appreciate Heilke’s helpful approach to his position. He briefly recounts Anabaptist origins by giving the specific date (January 21, 1525) and the historical significance of their fateful beginning. On that day, the “re-baptism” of George Blaurock, a Roman Catholic priest, by the son of a Zurich patrician, Conrad Blaurock, ignited implications far greater than these participants probably realized (p. 21). According to Heilke, within ten years of this first baptism, “nearly the entire first generation of Anabaptist leaders had been executed” (p. 21). These gruesome beginnings linger throughout the development of Anabaptist thought, including its engagement to political movements and authorities. Heilke’s presentation describes the tenets of Anabaptist identity and its theological distinctives. Rather than having a “single-identifiable individual” leading this movement with a specific reform agenda in mind, the Anabaptist movement was essentially a “lay-led movement, p. 25, emphasis in original). This vital distinction provides a rationale as to why the Anabaptist position focuses on personal ethics, not public policy. Heilke’s presentation locates the Anabaptist position as one deeply devoted to Jesus’ ethical teachings and the implications for radical living. As a result, many see this position as one that cherishes separation from society. While many Anabaptists have political positions and some identify with tenets of major party politics, the position concerns itself with individual ethics as a means for societal impact. Robert Benne (Ph.D., University of Chicago) presents the Lutheran view. He is the Jordan Trexler Professor Emeritus of Religion at Roanoke College. He taught full-time at Roanoke for eighteen years prior to transitioning into his Professor Emeritus position. He founded the Roanoke College Center for Religion and continues to be a research associate within the department. He has published widely on the relationship of Christianity and culture. Benne locates the Lutheran view beginning when Luther posted his ninety-five theses to the Castle Church door at Wittenburg. Luther argued for a distinction between the power exhibited by the state and the church. The church possessed the power of the Word, while the state possessed the power of the sword. God’s rule and reign was in both realms. He reigned over the state officials enforcing the law and through the gospel in the life of the church. Thus, the Lutheran vision is one with a clear law/gospel distinction. Benne notes citizenship is crucial to unmasking the Lutheran view of church and politics. The government, and the politics that comprise social policy and law, are a post-fall reality in the Lutheran worldview. The government is to curb evil acts and forces, and Christians are tasked with knowing the difference between the two kingdoms. Benne believes future Lutheran interactions connecting the church to politics or public policy will come from indirect forms. Christians strengthened through the church will live out the implications of their faith in their secular workplaces. Benne notes the checkered past of Lutheran action (or inaction), and he establishes necessary parameters for his position. Bruce L. Fields (Ph.D., Marquette University) presents the Black Church view. Fields is Associate Professor of Biblical and Systematic Theology and Chair of the Biblical and Systematic Theology Department at Trinity Evangelical Divinity School. He authored the volume, Black Theology: 3 Crucial Questions for the Evangelical Church, and his areas of research focus on the Epistle of Philippians and black/liberation theology. Fields provides an excellent summary which exposes the entrenched struggle of the Black Church experience and its corresponding eschatological hope for transformation. Locating a precise Black Church political theology is difficult, according to Fields. On the one hand, political powers have brought oppression and marginalization to those associated with the Black Church; yet on the other hand, much of the social reform that has taken place in the American Black Church context is a result of government intervention. As a result, there is both a negative sense of realized marginalization and positive action between those in this position and those in political power. Students unaware of the real and painful struggles of those constituting the American Black Church will benefit greatly from this chapter. Fields provides an excellent summary of the major historical, political, and social trends of this position. Perhaps the most illuminating aspect of Fields’s essay is his conclusion. In these remarks he gives a clear picture of the importance of historical grounding for his position. He believes “the presence of Black people in the halls of power is absolutely critical, as their voice serves as a constant reminder of the potential degeneracy of human government” (p. 123). While the Black Church seeks further social and cultural reform, Fields asserts a critical relationship between this position’s future goals and its past exists. The echoes of past dehumanization provide fuel to sustain their march toward equality in social and institutional reforms. Fields believes the societal work that needs to be done must be an ecclesial reality. The triumph he desires comes from a “Holy Spirit empowered love ascending through churches to embrace one another regardless of race and ethnicity” (p. 123). Readers will find Fields’s view refreshing in that he tethers together cultural transformation and church vibrancy. James K. A. Smith (Ph.D., Villanova University) presents the Reformed view. Smith is Professor of Philosophy at Calvin College where he holds the Gary & Henrietta Byker Chair in Applied Reformed Theology and Worldview, and he is an accomplished author of scholarly and popular level books and articles. Smith’s chapter proves excellent and worth the price of the book alone. Smith admits the impossibility of presenting the Reformed view because a single view does not exist. Rather, Smith believes his Reformed position emerges from a post-reformation Kuyperian model. For Smith, “A Reformed understanding of the relationship between the church and politics is bound up with a wider constellation of convictions about the nature of creation, culture, and the common good” (p. 140). This wider conviction is one of transformation, which dispels distinctions between secular and sacred. In this view, the Reformation was not merely about individual salvation; Instead, the Reformation is more broadly to be understood as “a Christian reform movement concerned with the shape of social life” (p. 141). Understanding Smith’s “reformed social vision” is impossible without grasping the relationship between creation and eschatology. God created the world beautifully but left it to be cultivated by his image bearers. Humanity is tasked to work out the possibilities of the cultural goods inherent within the created world. Human government, then, is not to be understood as a divinely given construct. He notes, “Government and the political institutions that shape our lives are not ‘divine’ in the sense of being handed down from God like the descent of the New Jerusalem (Rev. 21-1-2)” (p. 142). Smith believes all cultural institutions are products of human creation. Humanity is given the raw material by God in creation, and they are tasked with ordering their societal constructions with God’s design. Sin corrupted humanity, and its corruption seeped into the social structures of human invention as well. Thus, these human constructs need transformation. Christians should seek the transformation of society with the future in mind because “the eschaton functions as a normative vision for contemporary cultural labor” (p. 147). This vision does not seek to bring about the eschatological kingdom on earth, but to strive for the good laden in the raw materials of the lost Eden. The New Jerusalem is in view because it represents God’s desire for his creation. Politics and government are aspects of a good but fallen creation, and “this conviction propels believers into government and politics” (p. 151). The Reformed tradition has a history of political statesmen (Kuyper and Bavinck, for example). Smith believes the government is just one of many organizations Christians must use to bring about societal transformation. The government’s role, then, is limited; human flourishing and transformation must take place across a broad spectrum of human relationships and structures. Brian Benestad (Ph.D., Boston College) presents the Catholic view. Benestad is the D’Amour Chair of Catholic Thought at Assumption College in Worcester, Massachusetts, where he teaches in the Department of Theology. He has many publications focused on the Catholic faith and its integration within the public square, and he has lectured widely on various aspects of Catholic social doctrine. The Catholic position encompasses the broadest interaction between church and state due to its vast array of authoritative teachings (examples include, for example, Papal encyclicals and The Pontifical Council for Justice and Peace). Benestad explains that the unified body of teaching known as the Catholic social doctrine not only compels Catholics into the public square, but these teaching prepare them for applying their faith across broad public arenas. Benestad believes contemporary Catholic social doctrine is impossible to discern without fully considering the influence of Augustine and Thomas Aquinas (p. 203). Augustine’s contribution centers on justice within the political and social order. The church’s teaching on grace and love demonstrates the dignity of all individuals, and this resident dignity within humanity is the motivation to contribute to human flourishing through the public square. Aquinas’s contribution centers upon his systematic treatment of virtue and its correlation to personal witness and social justice. Regarding Aquinas’s virtue ethics, Benestad believes Aquinas’s “reflections on the law as an instrument to restrain the bad and guide the good are especially needed today” (p. 203). Benestad concludes by nuancing the Catholic social doctrine’s role. While it fails to bear the burden of ultimate responsibility of ushering in a just society, it does contribute by informing and training Catholic adherent to participate as engaged citizens within the public square (p. 204). Finally, Amy Black helps readers when she concludes the book by tracing the complex political associations demonstrated by various strands within Christianity. She evaluates presidential election data to reveal the voting tendencies of the groups discussed within the chapters of this book. In addition, Black suggests the five positions have four core principles of agreement: (1) the centrality of the church and its witness to the gospel, (2) the importance of governing institutions, (3) the importance of civil/free associations, and (4) a concern for cultivating virtue in individuals and working toward a more virtuous society (p. 228). Regardless of one’s position, these four principles should cause Christians to engage one another with charity and grace when discussing the church and its relationship to politics. This book successfully introduces readers to five views commonly expressed by Christians regarding the relationship between the church and politics. There are numerous strengths in this book, but I will mention only three. First, this book achieves its stated goal of presenting various views in succinct, yet illuminating detail. Students unaware of these positions will find this volume to be an excellent first step in uncovering the vast array of Christian positions. It is not easy to communicate the distinctions between various church traditions and their interaction with politics in historical, theological, and practical depth, but the contributors wisely use their words to convey their positions fully and fairly. Second, the layout of these types of books is a great help to students because each contributor responds to every position presented. While there are instances where readers will desire much more dialogue, the contributors were gracious and explanatory in their responses to one another. Some of the responses helped to distinguish critical differences between the contributors. Third, the positions reveal a wide spectrum among Christians, yet it is clear that each position realizes that the church is not called upon to remain silent. The gospel is public truth, and Christians have no business being silent in the public square. A few weaknesses should be noted, but one must keep in mind the limitations of books organized such as this one. The authors are not exhaustive in their presentation of their views; thus, some readers will desire more depth in certain sections. In addition, because these views hinge upon biblical teachings, one would expect more explicit exegesis of relevant passages germane to this discussion. Often biblical passages are spoken of broadly, even though biblical and theological themes are used as motivations for a position’s political ethic. For example, in his presentation of the Black Church position, Fields does not give significant attention to any biblical text, but he does helpfully locate the eschatological hope inherent within this position. This criticism is not reserved for Fields alone; each contributor speaks about the Bible’s implications but not much about its exhortations. A second criticism is in the lack of substantive dialogue in the responses. At times, the respondents merely emphasize differences rather than exposing the errors of the perspective under review. Students should read this book because it is necessary for Christians to wrestle with this subject. The genius of books containing various viewpoints lies within the succinct presentations and the interactions from the contributors. The Church and Politics is filled with numerous footnotes that can point eager students to further resources. It is possible that a Christian could read this book and not identify with any of the five positions. The value of this book remains, however, because these positions will resonate with a vast majority of Christians.